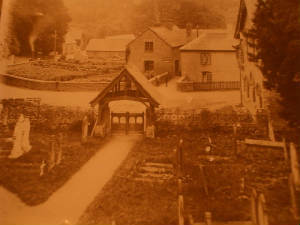 The Cistercian abbey of Cwm-hir is of great historical significance. Its early history is somewhat obscure but the permanent foundation dates to 1176. It was twice attacked during the late twelfth century by Hugh de Mortimer and eventually given a Norman charter. 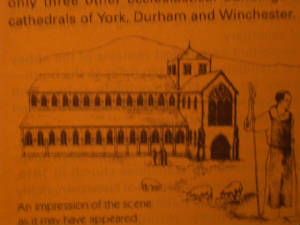 From 1197 onwards, the earlier wooden building began to be replaced by a more permanent stone structure and, although it was never fully completed, the abbey was, at this time, of a size that was only surpassed by those at York Durham and Winchester .There is a also long-standing tradition, based on the evidence of one chronicle, that the body of Llywelyn ap Gruffudd was buried at Abbey Cwmhir after his death at Cilmeri, near Builth Wells, in 1282. 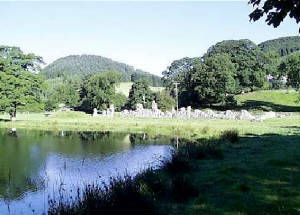 The remains of the abbey ruins are open to the public and can be acsessed off the village road. 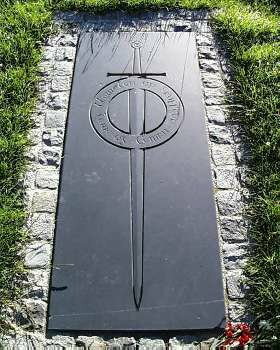 There is also a stone slab layed here to commemorate the burial of PrinceLllewellyn. Close to the Abbey is a large man made lake which is stocked with trout . The Abbey it is said was intended for up to 60 Monks even though there was probably never more than a handfull.The extensive scale of the design perhaps explains why it was never finished in those days churches were built for the glory of God unstinted in sise and cost.The Abbey consisted of nave,aisle and unfinished transept.Ther were fourteen beautifuly carved stone arches on either side of the nave,six of these can be seen today, they were transported in 1542 to Llanidloes church 10 miles away. The Abbey belonged to the Cisrercian order or white Monks after there white habit, and the remoteness of its position is typical of sites chosen by them.They were big fish eaters and great breeders of horses and sheep.